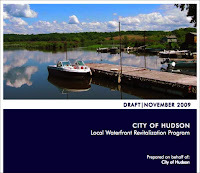 At the Formal Hudson Common Council meeting tonight, the council passed a resolution to accept the Draft LWRP (Local Waterfront Revitalization Program) and Draft GEIS (Generic Environmental Impact Statement). This moves the LWRP and GEIS into the next phase. There is still much to work out. The next phase will be a Public Hearing on January 20 where comments, criticisms and alternatives will be solicited from the public. We will announce the meeting time and location as soon as it becomes available. This is a major step forward for the revitalization program which has been in development in one form or another for decades.